Lindsey’s Super Heroes Mural Project was featured by PBS KQED Arts 2018 Year in Review video. Lindsey Millikan was the lead artist of this Super Hero Mural #4 in partnership with Attitudinal Healing Connection and Hoover Elementary School. "A group of Hoover Elementary students took to the streets of West Oakland to fight for their right to paint. The 580 Freeway underpass on West Street was meant to be covered, in March, with a colorful mural inspired by the students' art. But now Caltrans, which owns the wall, has delayed the project." "An artist can and should have many roles in society. Personally, I strive to create visual art that has a lasting impact by expressing a universal truth through my own individual experience. In this vein, my work encourages people to look outside of themselves, encourages inclusion and connection and hopefully ignites a conversation." One of Lindsey Millikan’s biggest personal influences as an artist and person over the past several years has been the experience that is touched on in this wonderful video by Kelly Whalen with KQED. Lindsey was the Lead Assistant on this Super Hero Mural #3 with AHC. When 27-year-old artist Antonio Ramos was shot and killed last fall while painting a mural under a highway overpass in West Oakland, the story of his death captured national and international headlines. But very little was reported about Ramos, the self-taught artist whose passion for social justice and illustrating the stories of indigenous people was recognized by those who knew him best. "That's really the idea, is getting our young people to dream about how to solve these problems," said Harris. "We're not these passive citizens here — victims of our communities. ... This can't just be it for so many young people. We have to be able to create a better reality." This was Lindsey Millikan’s first project as Lead Assistant with Attitudinal Healing Connection at the beginning of the Super Heroes Mural Project. California Cowboy’s Design Saloon, above, at 1841 Polk St., takes design seriously with clothing and art. "There's a beautiful new mural being completed under the I-580 underpass on San Pablo Avenue. It features West Oakland's music history, people and architecture. The elements of the mural were designed by McClymonds High School students, and put together by head artist David Burke. The mural is sponsored by Attitudinal Healing Connection, which is based nearby...This mural is one of six planned for West Oakland." “This mural represents everything right about Oakland and everything wrong about Oakland,” Oakland Mayor Libby Schaaf said. "This is devastating," said Dave Burke, a mural project art director. "We're doing these murals especially because there's violence and incidents here like this." The mural Ramos was working on is slated to cover 4,000 square feet of wall and is part of an ongoing project between artists and Oakland students. The Oakland Super Heroes Mural Project (OSH) is a crucial community development effort that will engage 105 youth as change agents in their community. This project aims to resolve issues that plague our city, create over 30 jobs, enhance our neighborhoods, and reduce blight... These murals will serve as a gateway to West and Downtown Oakland and The Oakland Super Heroes Mural Project will become a key component of how this community is perceived. The Oakland Super Heroes Mural Project brings 12 local Oakland artists together to render the mural designed by lead artist Refa One. The mural is based on a story of four super heroes imagined by students at Westlake Middle School as part of the ArtEsteem "Self as Super Hero" curriculum. The mural is the second of seven murals, all located on underpasses along the 580 freeway in West Oakland, that is part of an ongoing project by Attitudinal Healing Connections to invite middle and high school students to be part of a positive transformation of their neighborhood. I felt this was a super out of touch bordering on offensive article by the New York Times about Antonio and our mural. So read if you wish, but know that everyone in this article despises the tone chosen by this reporter. The article title and first paragraph is rather horrendous. "Venturing down San Pablo Avenue under Interstate 580, one could not have the vibrant colors that transformed a dreary wall in one of the highest crime areas in Oakland into a mural that reflects hope and possibility." "On Thursday, the Oakland Superheroes Mural Project, an initiative by the Oakland-based nonprofit, Attitudinal Healing Connection (AHC), to revitalize and add beauty to some of the city’s blighted areas, launched the first in a series of six planned street murals under the bridge on San Pablo Avenue and 35th Street." “Would you get behind something if you knew it had the power to change your neighborhood? That’s the question posed by the Oakland Super Hero Mural Project, a four-phase project that’s putting up exciting murals along the West Oakland / Emeryville border. The first mural, under the 580 freeway along San Pablo Avenue between 35th and 36th Streets, is already up." "Friends and colleagues gathered Wednesday morning to honor an artist who was murdered in Oakland while doing what he loved. Antonio Ramos was shot and killed while working on a mural that his colleagues are now vowing to finish." 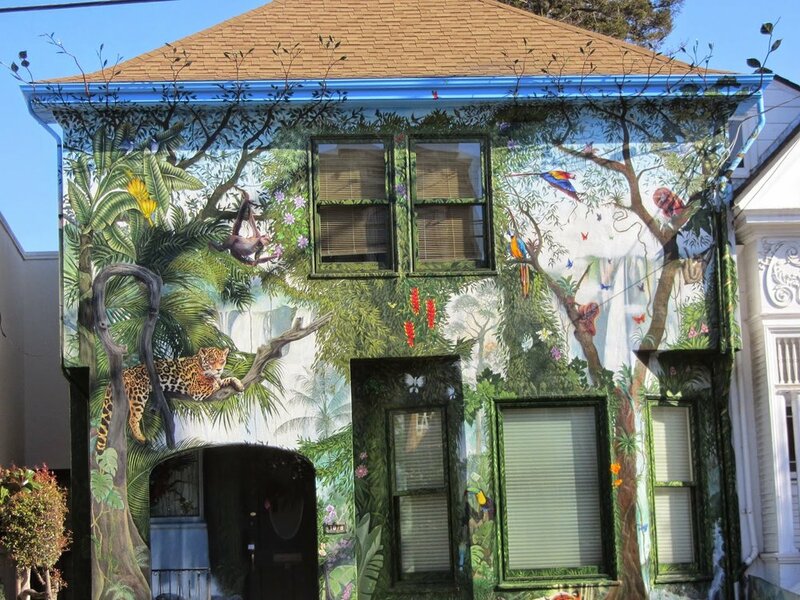 "We enjoyed various murals, the "jungle house," the mosaic doorway thresholds and walls." This is the personal blog from the homeowner who documented the journey of the house from it's previous iteration to current masterpiece. Some backhanded love from the realty fam. It's some clickbait gold. Can you spot the differences? Good job, people!" "Did you know that we have 3 new Alameda Point murals? These 3 larger than life paintings were commissioned by the Whimsy Festival. The Whimsy Festival came to town last April. Next time you are out on the point, go on a bit of a scavenger hunt. I found the murals still standing tall just by exploring a little." "Be Instagram Worthy at Alameda Point"
“WHIMSY FEST,” a creative arts festival at Alameda Point on Saturday, will celebrate the unveiling of several large-scale murals, craft vendors, live music and local beer and wine. The free event will take place from 1 to 6 p.m.
Activities will include The World’s Shortest Parade, music and a DIY craft station. The public is invited to wear whimsical costumes and participate in the parade alongside brass bands, jugglers, clowns and multiple art cars. Food and beverage purveyors will include Kenny’s Heart and Soul, Fist of Flour, Gotta Love Kettle Corn, and Lucky 13 will be pouring local Alameda beer and wine. Photo Gallery from Whimsy Fest where Lindsey Millikan's mural was unveiled.